I went to the COBE event at VCU, Virginia Commonwealth University and saw Dr. Kevin McCauley speak (the dude seriously needs a decent online bio). For many years, Charles and I had a discussion about his “thrill seeking” which I never felt was quite the right phrase since he wasn’t skiing backwards down black diamond ski slopes. At one point Charles and I had a discussion that perhaps his brain didn’t make endorphins and made too much adrenalin (since he suffered from anxiety). 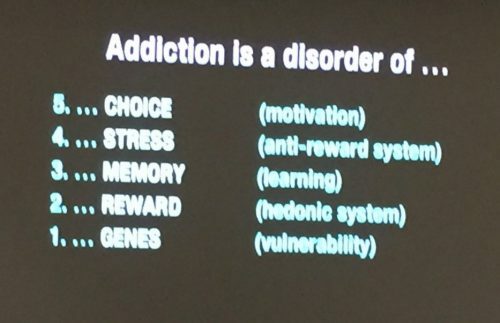 When Dr. McCauley said “broken reward system” in his presentation, I thought I hit the lottery. That’s the phrase I’d been looking for! Charles suffered a broken reward system. And by that I mean he just never got enough fun of any kind starting at a really early age. I do remember one time we spent all day at King’s Dominion, a theme park, and we came home around 5pm and he asked if he could go to Bush Gardens, another theme park. Not next week or the next day. Right then. He’d taken every roller coaster there was that day. All of us were dead tired and Charles wanted more. Begged for more. I remember how exhausted I was but he wouldn’t let up. He never did. After I said we weren’t going to Bush Gardens that night, he begged to have a group of kids over for a spend the night party. When I said no to that, he kept at it. Could he have just one friend over? What about just a playdate that night? Could he have a friend to dinner which would morph into him begging to have the kid spend the night. This was a typical scenario every single day. Disney? Charles got his money’s worth. I’ve never seen someone do Disney like he could. And those sleepovers? Those kids were dead tired and cranky the next day because Charles didn’t sleep well. And when people were over, he kept them up all night long playing games. All computers went off in our house at 10pm and no TV was allowed most week nights. I would get up multiple times to tell the kids to go to sleep. But he’d play board games or games he’d make up all night long. I tried everything I could think of to get that child to sleep. We went to sleep doctors, engaged in biofeedback and I tried to get him to practice good sleep hygiene. You name it, we tried it. But you can’t force someone to sleep. And his issues with sleep started at 18 months. When he went to the grocery store with me, he always wanted the largest bag of candy and would attempt to fill up my cart with all kinds of sugary snacks. The rule was one treat and he’d try to find ways to make his “one treat” the largest item he could find and I would have to further define it. Then he’d try to argue his “one thing” didn’t count as a treat. He pushed on everything I pushed back on. I basically had to stop taking him to the grocery store. I NEVER gave in on that. And he NEVER stopped pushing and trying to get me to comply. You’d think at some point most kids would realize it’s pointless after years of sticking to it without budging at all. But not Charles. Yes, he was sweet and charming. But also utterly exhausting since he wanted 24/7 entertainment and bowls full of sugar which I was not going to supply. He desperately craved reward, reward, reward and what he got was never enough. As a mom, holding my boundary was tough and Charles was absolutely relentless. That had been my fear. Despite holding my ground and setting limits, he still went down that path. I think he was genetically disposed to have substance abuse disorder from a young age. I think as a whole, the broken reward system explains why he needed constant entertainment, why he was always seeking “fun” long after everyone else had their fill. And I think it’s the hallmark of substance use disorder. The brain just keeps telling them then “need” that drug. Can’t live without it. Which is why it’s so hard to get away from. It’s too late for my child. He died by suicide June 5, 2015 having suffered from addiction, depression and anxiety. 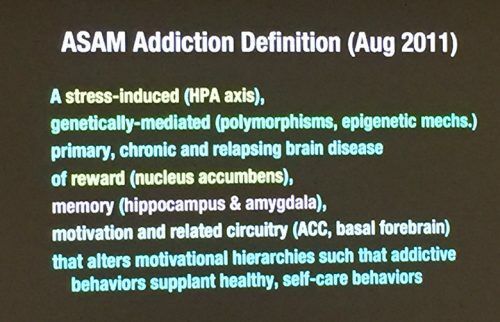 I have to wonder if they can curb addiction by focusing on the limbic system of the brain. I would bet that’s where the secret lies.